Who’s the founder and leader of the NAR cult? 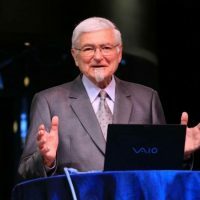 In a piece over at Churchwatch Central titled “Why Wagner WAS the Leader of the NAR (Part 4): Generals International interview in 2000 reveals the truth” they examine the late C. Peter Wagner’s claim that the NAR has no leader. Back in 2011 I expressed my concern (here) over former governor of Texas Rick Perry’s ties to the New Apostolic Reformation cult while he was a top tier candidate for President of the U.S. In an effort to do damage control, “Presiding Apostle of the International Coalition of Apostles” Peter Wagner quickly shot an email to his followers vehemently denying that the NAR is a cult, as I claimed, and went to the trouble of explaining exactly what the NAR is as only he could do. In the email, the self-professed apostle stated that “It will surprise some to know that the NAR embraces the largest non-Catholic segment of world Christianity.” This statement ought to give one pause….because what he said is true. The above quote from C. Peter Wagner was in an article he wrote titled ‘The New Apostolic Reformation Is Not a Cult‘. His attempt to distance himself as being the head of the New Apostolic Reformation (NAR) needs to be noted.